The Expert Blogger Interview provided me an opportunity to reach out to successful bloggers with their own stories to share. 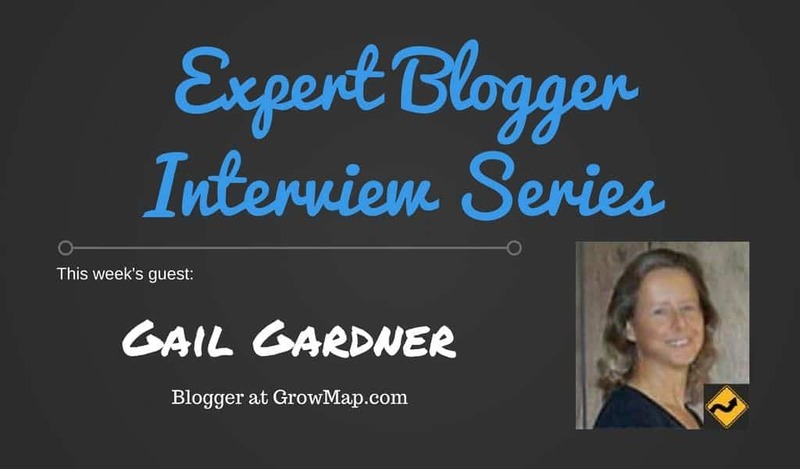 Some of the bloggers I interviewed shared a common answer: Gail Gardner. Bloggers like Uttoran Sen to David Leonhardt and Erik Emanuelli list down Gail as one of the bloggers whom they look up to. Looking at Gail’s body of work starting with her blog GrowMap, it is easy to see why. Her expertise surpasses the posts she publishes on her blog. Her ability to collaborate and connect with other bloggers is an inspiration to aspiring bloggers who want to achieve success in this field. I have personally talked to Gail and I also believe that she is one of the bloggers I look up to for advice and guidance. To learn more about Gail’s journey to blogging success and being an inspiration to her contemporaries, read her interview below. 1. What was the moment that made you decide to become a professional blogger? 2. Before you started blogging, what were you doing as a professional? 3. What was the biggest obstacle that you had to overcome as a beginner blogger? 4. Any horror client stories you would like to share with us and how you dealt with the situation? 5. Which blog posts you have written that you feel the proudest? 6. Who among your blogging peers do you consider the best and why? 7. What do you think separates yourself from other good bloggers out there? 8. List down the blogging tools that you use and explain why people should use them for their blogs. 9. How “successful” would you consider your blog? 10. What do you think are the upcoming blogging trends people need to watch out for? 11. If there’s any one advice that you would say to a starting blogger, what would it be? I originally started blogging when Marty Weintraub of AimClear Marketing installed a blog for me to write about AdWords and other pay-per-click (PPC) strategies. At that time, I was the primary mod at SearchEngineForums who answered questions about PPC and also doing PPC full time. For 5.5 years I was managing PPC accounts for clients on Yahoo! Search, AdWords, and other smaller PPC platforms. Before that, I worked for IBM for 23 years repairing hardware the entire time and managing mainframe accounts the last 14 or 15 years. We (Derek Semmler and myself) started out trying to launch 4 or 5 blogs at once. I quickly found I did not know how to manage multiple blogs because there is so much to do in each one. I did finally learn this while managing 12 blogs for a client. However, those 4-5 blogs are now well-seasoned 8-year-old sites that are neglected. So if anyone wants to partner with us (me and an existing partner with technical skills), please inquire. When I managed PPC clients and before that horse owners and after that writing clients, I quickly learned that many would take advantage of you. Some are quite skilled at it. That is why I advise freelancers today to get paid in advance. 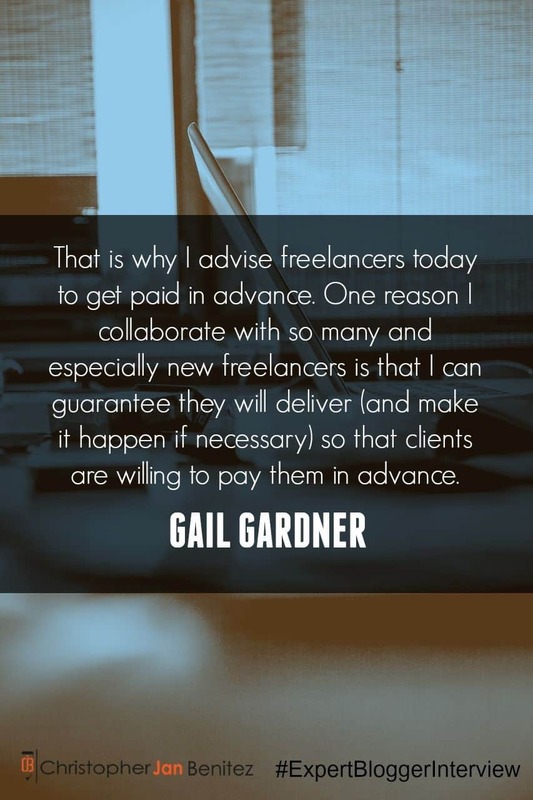 One reason I collaborate with so many and especially new freelancers is that I can guarantee they will deliver (and make it happen if necessary) so that clients are willing to pay them in advance. We do have some trusted agencies we work with who pay on delivery because they have a track record of paying consistently. Any time one fails to pay promptly, from then on they are required to pay 100% cash in advance. Wow, that is a hard question. I have written hundreds of posts over the years, and they are scattered on many sites besides my own. The one I share the most often explains our Blogger Mastermind mentoring group and the free resources we provide. If you want to know how to do something, Kristi Hines @KristiHines and @Kikolani is superb. Her main blog is at Kikolani. For expert and tool roundup posts on the latest or best solutions, look to Ann Smarty @SEOSmarty, founder of MyBlogU. Deborah Anderson @SocialWebCafe has interviewed me on video more than anyone else. Our post on her site on how to use Canva is very popular. Moreover, the best storytelling writer around is Jon Morrow @JonMorrow. Writers who want to learn that skill should seriously consider his courses. While at IBM, I spent 23 years in every size business in every vertical. Then I spent 5.5 years converting search traffic into sales for more small businesses and e-commerce sites. This experience is what I can draw from when writing and advising clients. There are other writers as capable of putting together words on a page as I am, but the percentage with as much business experience is small. That gives me an advantage that is not easily acquired by new bloggers. BuzzSumo for research and ideation. CoSchedule Headline Analyzer for testing headlines. Plugins are essential for serious bloggers. I could not stand to blog without the GrowMap Anti-Spambot Plugin (GASP) because the bot spam was up to 1000+ a day without it. With it, comments dropped to about 40 a day. It was so bad I had volunteers deleting spam because Akismet put all the best comments into spam along with the junk. Fortunately, Andy Bailey who created CommentLuv created GASP for us. If you have ever checked a box to prove you were human or not a spammer, you have seen it. I also run the CommentLuv Premium plugin with the CommentLuv links set to go dofollow after a particular number of comments. For SEO, I am running Yoast. For security, I run WordFence set very tight and also have a pop-up protecting my login page because hackers were running so many cracking programs against my site it was taking the entire server down. Social Warfare saved my existing Twitter counts and then got the new counts back when Twitter took them away. This is important as Twitter is my #1 social network with 98,000+ followers (Top 1%) and a huge referrer of traffic. Social proof affects reader behavior, so I have to have those counts to encourage both sharing and reading. It has Click-to-tweet built in. Anytime you can put a great stat, comment or quote in a Click-to-tweet you can increase shares of your content and make that information stand out in the post. Social Warfare allows you to set 3 different images for your social sharing. This gives you multiple images to attract different people to your content. In some posts I can use the featured image native to WordPress for Twitter, a different image for Facebook and LinkedIn, and an infographic for Pinterest. If you do not add multiple images, it uses the featured image so it is easy to use only when you need it. MavSocial for scheduling my content and images for more blog traffic. I am spoiled now because my VA Eleaza Devilleres schedules my MavSocial posts for me. MavSocial pushes images, SlideShares, infographics, and videos to Twitter, Facebook, LinkedIn, Tumblr and now Instagram. They are one of the few sharing solutions that can natively push videos to Facebook. Twitterfeed to share great content automatically. ViralContentBuzz (VCB) is a free way anyone can use to get influencers – both those who know me and those I do not even know to share my content on Twitter, Facebook, StumbleUpon, and Pinterest. I also use JustRetweet which works very similarly to VCB and gets you tweets, Facebook likes, and Google +1s. Staged pulls videos from YouTube channels I choose and puts them into landing pages I can use to promote anything from getting connections to my LinkedIn profile to specific posts, to following me on Facebook and Pinterest. It also lets me manage my Twitter following and grow it. You can see a sample by clicking here. That always depends on how you define success, doesn’t it? It is not well-monetized because I primarily use it to attract small business clients and collaborators. It did not have to make money because I make money providing services. However, it could if I would just focus on making that happen or find the right partner for that aspect of blogging. I am successful in that I have enough demand to have 5 assistants now. Jessica Mouser is full-time and my Co-Editor on GrowMap and does writing for clients as well. Anything I can do, I can teach Jessica, and she can immediately pick it up. Besides Eleaza mentioned earlier who works full time, I also have part-time assistants: Katrina Cabatingan, Donewell Mombay, and Chirag Chauhan and his team. They keep on top of tasks, follow-up with writers and clients, do research, and schedule shares in JustRetweet and ViralContentBuzz. We also accept requests for VA work from collaborators, small businesses, and agencies. Anything I can teach them I can have them do or Jessica or I will do it. Having a blog can be expensive when it gets larger, so once you know you want to stick with it, focus on monetizing or at least having enough income to pay for good hosting. At some point, the internet could become pay-to-play, so you want to have income or connections in case that happens. There are many bloggers who have launched writing careers from their own blogs or by guest blogging. The demand is still high, but heavy competition from other countries where many can write passable English for a lot less money may eventually exert downward pressure on earnings. The key to making sure that does not affect what you get paid is to continually be adding to your influence and strengthening your skills. Even though the going rate for a better than average blog post of about 700 words is $150, some ghost writers are commanding $450-$750+ and have many clients waiting days for them to get to their work. The $35 and $50 writers will never impact their incomes. Become a copywriter who can drive conversions. They make 10x+ more money for the same amount of work. Learn a skill that is in demand, but has low competition. The ability to analyze big data, or analytics, or do conversion optimization pays extremely well for the same reason copywriting does: you actually increase the incomes of those who pay you. Currently, I am taking Simplilearn’s Full-Stack Digital Marketer Masters Program Advanced Online Marketing Certification Training Bundle to enhance my marketing skills. So far I have only watched two of them, but I feel writers could get substantial value from this series. Get a mentor and start collaborating. There is no reason to reinvent the wheel when so many already have experience doing everything you need to do. Join our Blogger Mastermind collaboration and you can get instant answers anytime you need them and assistance on request. You can also get access to the resources I have been saving for years. Watch the video in the Blogger Mastermind post to get an idea how beneficial this can be to you.